How VFD improve the system power factor? 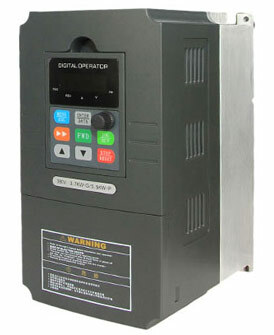 A variable frequency drive (VFD) will improve the system power factor to which it is connected, primarily because the motor reactive current is supplied by the DC bus, rather than the supply system. This will only improve the displacement power factor. Modern VFDs with AFE draw almost sinusoidal current from the supply, so power factor on the source side can be controlled up to unity and the generated harmonics are minimal so the system distortion power factor is not greatly affected either. The sole purpose of the DC bus capacitors (in a VSI drive) is to supply the motor load reactive power, not to improve the distribution system power factor, although this is a beneficial consequence. Do not add capacitors to the DC bus of a single unit VFD, this is only sensible if your system employs a common DC bus and you are engineering VFD upgrades and additions. The VFD will be designed such that the DC bus capacitance will supply rated motor load, with a little headroom added. Low voltage VFDs almost all have full-wave diode bridge rectifiers and draw their current at the peak of the voltage wave, resulting in a 0.95 power factor or better. They draw their current over a very short duration at the peak, so depending on the short-circuit available current of the feeder, they may produce significant harmonic content, but the POWER FACTOR is excellent. The addition of a 3% or 5% impedance line reactor to the input of a VFD won't significantly affect the unit's power factor, but will (somewhat) improve its harmonics and also serves as cheap protection against line-side voltage transients causing nuisance tripping of the drive. No power factor correction needs to be applied at the motor, and doing so will result in a drive failure due to the PWM output of the VFD versus a sine wave. AFE drives are a con. Their efficiency is 2% less than active filter with 6 pulse or series wide spectrum with 6 pulse. That means US$ 1000s over the years in running costs. They have harmonic current emissions at the switching frequency if the AFE rectifier at the main side from 2.5-3.5kHz) which are usually 4-5% Ithd. The EMI emssions are a lot higher than 6 pulses and the input L-C-L filter also has issues with leading DPF when the drive is quiescent or lightly loaded.